Four hundred feet above Jodhpur stands Mehrangarh Fort, with walls 118 feet high and 69 feet wide. Scars remain from cannonballs and bullets. But the centuries old fortress has never been conquered by military force. A cobbled road snakes through seven gates, two of which are named "Victory." Even today the palaces inside draw the loyalty of Rajputs. Uniformed sentries both guard and guide. But one sentry proudly includes a turban and beard instead of the usual cap and clean shave. 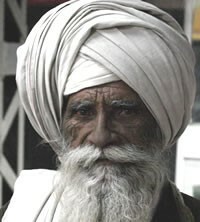 He is a Rajput Sikh. All Rajputs rightly boast of their military prowess, and many own agricultural land as well. 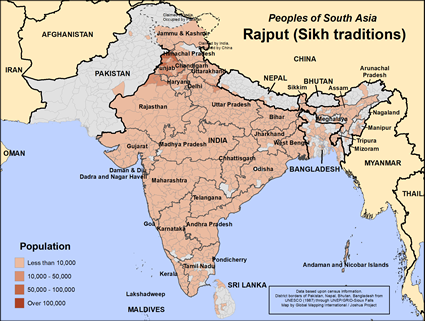 While the Sikh population tends to be concentrated in Punjab State, its neighbor to the south, Rajasthan, is home to most Rajputs. Though millions of Rajputs are Hindu, there are nearly 760,000 Sikhs among them. Hindu Rajputs recognize thousands of gods, but the Sikh Rajputs follow the "True Name," the one true God. By meditating on the name of God, Sikhs believe they will pass through reincarnations to eventually merge with this universal force. * Pray that the Rajput Sikhs will recognize the Lord Jesus as a mighty fortress in whom they can find rest. * Pray that the Holy Spirit will melt the pride of the Rajput Sikhs so that they will bow before the God of our Lord Jesus Christ.View Rajput (Sikh traditions) in all countries.